Danny Michell, Jr. (Freda Huson’s brother) was close to death. Deep in a coma, the doctors were ready to pull the plug. It was at that moment that Danny had a dream, or vision. He went to a place in his mind with a beautiful, clear, flowing river. All of his elders were there, but they were young. In the vision he could walk, although in life he used a wheelchair. The ancestors and elders touched him and brought him back to life – he woke up from the coma. The doctors were amazed. Danny believed the place he went in the dream was at Poplar Lake, that the family often went to. But when he talked about it with his relatives, they realized it was the Wedzin Kwah, on the Unist’ot’en traditional territory. When Unist’ot’en people visit their land, they have emotional and healing experiences like this one. 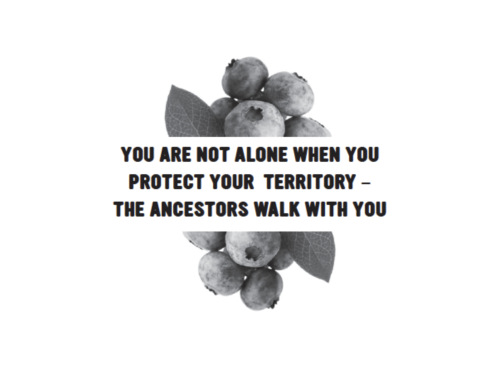 You are not alone when you protect your territory – the ancestors walk with you.